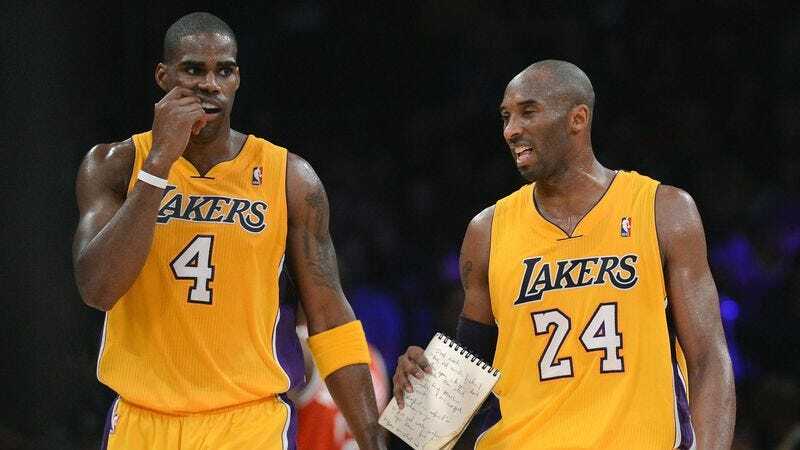 OAKLAND—In an effort to provide guidance to a teammate, Lakers shooting guard Kobe Bryant reportedly created a helpful 435-item list Monday, detailing aspects of Antawn Jamison’s game that the forward needs to improve. Bryant, who presented a small notebook to Jamison at halftime of the team’s game against the Golden State Warriors, encouraged the Lakers forward to carefully study the comprehensive catalog of his numerous deficiencies as a basketball player. “There’s some stuff that you could never possibly accomplish given your basketball ability, but, you know, I just threw them on there anyway,” Bryant added. According to Bryant, the in-depth list identifies problem areas such as physical limitations, lackluster intensity, deficient passing skills, sloppy shooting mechanics, careless ball handling, as well as Jamison’s 298 different weaknesses as a defender. While Bryant confirmed that bullet points specify substandard efforts by Jamison to apply pressure, force turnovers, box-out opponents, rebound, and guard players on the perimeter, the list also provides numerous tips, drills, and strategies for improvement. Lakers sources confirmed that an excited Bryant spent approximately 15 minutes showing Jamison a portion of the list devoted to disappointing cerebral aspects of 36-year-old’s game, scrutinizing mental toughness, attitude, commitment, determination, and focus. Bryant, who also displayed a subsection of Jamison’s 6,000 mental errors, which were categorized as idiotic blunders, dipshit moves, or major fuckups, reportedly informed his teammate that he was always available to help or answer questions.